8.2.04: Red Sox GM Theo Epstein on WEEI with Dennis & Callahan: "The way we were thinking about Nomar is, well, what do we have the next two months? We reached the conclusion, given what we know from prior negotiations that we weren’t going to sign him, that it had stopped being a consideration, we were looking forward to the next two months and said ‘well, what do we have here?’ We have a situation where we’re likely to have Nomar Garciaparra and Ricky Gutierrez playing short and we don’t think that’s going to be enough, we haven’t been playing well, and Nomar’s likely to play less over the next month than he’s played the last month, so what are we trading here? 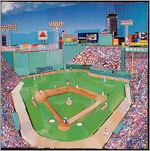 "In the end it was a straight baseball decision given the rather difficult situation we were in. (John Dennis: Theo, would you have been less likely to make that trade had Nomar told the trainers last Thursday, and by extension you and the rest of the organization that ‘the Achilles is fine, I’m 100%, I don’t think I’ll be taking any days off between now and the end of the baseball season?) Oh absolutely, that was the major impetus for the trade. It made a trade necessary, and difficult. We had to look at it from two standpoints. One, what if we don’t do anything? If we don’t do anything, then it’s Nomar, who says it’s really hurting, says he’s going to need significant time off, perhaps the DL in August, in order to finish the year healthy, so then it’s a significant amount of Ricky Gutierrez at short, and Nomar playing when he can. Or, if we do move him, now all of a sudden we have to tell the team that we’re talking to that this player is telling us that he feels like it’s going to blow out if it keeps playing the field. So, instead of being able to negotiate, we have to keep them that ‘make sure you know what you’re getting here, make sure you know this player’s going on the DL, because the only way we can make a trade with a player who is saying things to us that he was saying, was if we went out of our way to make sure the other team went in with eyes wide open. So not only did the health situation as reported by Nomar to us make it, in our mind, necessary to make a trade, but it made it much more difficult for obvious reasons... if that’s the case (that the Cubs were told that Nomar really wasn’t about to head on the DL) and that’s really what they believe, that’s odd, but, I won’t make any accusations of course, but perhaps they’re in a better position to take that gamble, with their depth in the middle infield, perhaps they can make the gamble a little bit more, I don’t know. "We do shoulder some blame in what basically became a doomed marriage, but I don't think he handled it very well this year, he wasn't quite the same guy in the clubhouse, he wasn't really a positive force in there. (Gerry: Do you think his unhappiness, his state of mind affected the team?) Umm, Yes... Was it different this year and did his teammates notice that? Yeah, that's probably the reality of this year." "Let's be honest, there are two months to go, and we're in an absolute dogfight for the wildcard. We're in an absolute dogfight just to get into the post-season... it's going to be an absolute dogfight and this is a year in which just about everything has gone wrong, and we need every single person associated with the organization needs to fight and scrap and find a way to have a really good two months, and not just 30 wins the rest of the way, 'cause that's not going to get it done, but to have a really good two months and salvage this season, and get into the post-season. And once the post-season starts, I really like this team, but we gotta scrap and fight and find a way to get in. That's a large part of what this trade was about, because the safe thing to do, for a lot of people, and the safe thing for the organization, was to probably not make a trade here and just say 'oh well, we're not sure how much we're gonna have Nomar but this team looks good on paper, let's just see how things go the rest of the way,' you know that would have been the safe thing for my career too, but I don't think we could have lived with that, because if we don't do anything and then Nomar goes on the DL and it's 30 games with Nomar the rest of the way, and 30 of Ricky Gutierrez, and we don't get in... I couldn't have lived with that. So instead, we do something that's not ideal (couldn't get the pitching he wanted), but I think we do something that we felt, gives us a better chance to salvage this season in a year where just about everything has gone wrong, including Nomar being largely unavailable the rest of the way." Gerry Callahan: "Nomar Takes Phony Express Out of Town"
Boston Herald 8.2.04: "I called him in his hotel room just to wish him luck and thank him for all he did for the franchise," Sox CEO Larry Lucchino said last night. "Then I asked him, 'How's the heel?' He said, 'It's great.'" "(I said,) 'Great? How can it be great? Two days ago, you thought you were going to have to go on the DL.' He said, 'Yeah, well, it's great now.'" Boston Globe 8.2.04: Yesterday, Garciaparra evaded answering questions about those assertions directly. At first, he said he could not respond because he did not know what the team had said. He then said that what was said was between him and the trainers, then emphasized that to date he only had missed a game or two at a time since coming off the DL. 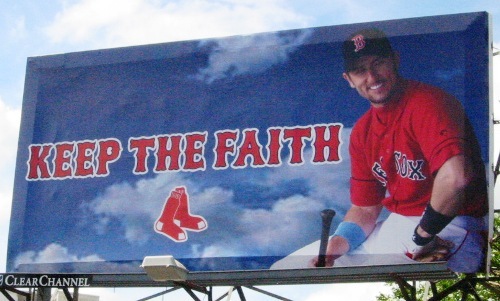 Boston Herald 8.2.04: According to club sources, Garciaparra informed the team's medical staff that the continuing discomfort in his Achilles tendon would probably require a stint on the disabled list sometime in the final two months of the season. Sox sources even alleged that Garciaparra said that he wanted to make sure he was healthy at the end of the season, when he would have to take a November physical as part of the free agent process. Chris Collins, NECN on WEEI’s Dennis & Callahan -- "He didn’t want to talk to Lucchino, they don’t have a good relationship… he said ‘how’s your Achilles’ heel doing?’ and he says "it’s fine." According to Nomar, he said “if we don’t take of my Achilles’ tendon, which means give it the proper rest, and take days off when we need to take days off… down the road, this whole thing is going to blow up, and we’re going to end up taking days off, and we’re going to end up on the DL." He said he had an MRI done a few days ago, and there was swelling. Him and the trainers have always been in agreement with his injury... there's a strong dislike between Nomar and Larry Lucchino, I think they lied to him quite a bit... I know he was told on several occasions that there absolutely, unequivocally wasn't going to be a trade." Is a Respected Chicago Writer on Lucchino's Payroll Too? Chicago Tribune’s Tom Sherer on WEEI’s Dennis & Callahan -- "The Cubs heard from Arn Tellem and a baseball person who was tight with Tellem, I’m going to guess it’s Jerry Reinsdorf, the owner of the White Sox who actually has a very good relationship with Tellem, who was assured that Tellem was not conning anybody. The basic bottom line is the Cubs were very satisfied that Garciaparra will be ‘extremely available,’ they may have to rest him every now and then, they have no problem with that, they rest guys all the time… they didn’t have the concerns physically for Nomar that the Red Sox had. They have no doubt that he’ll give 100% here. (Gerry Callahan: Really, it can’t be both... if he gives 100% and doesn’t go on the DL for the Cubs, then he was tanking it for the Red Sox) I know, well that’s my conclusion frankly. If he doesn’t miss a substantial number of games, then yes, I believe so. The conditions that existed in Boston, do not exist here." Gerry Callahan: "He's (Nomar's) a complete disgrace, he's a fraud, he's a phony."